Congresswoman proposes self-funding grants to encourage pharmacies to set up safe disposal sites for unused medications; report also endorses steps toward prevention, addiction treatment and recovery, and alternatives in pain management. 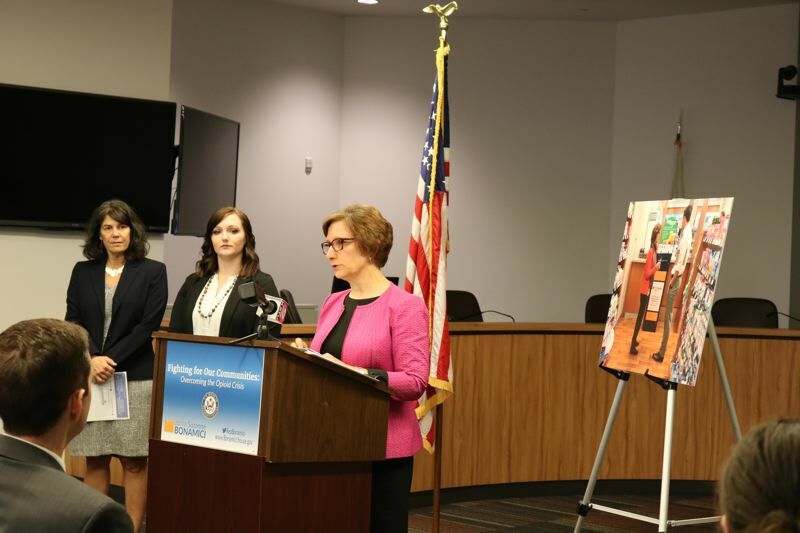 U.S. Rep. Suzanne Bonamici has added her own proposal to actions she says are needed for the nation to deal with opioid abuse. Bonamici, a Democrat from Beaverton, has released her priorities based on numerous meetings and visits she has made during the past several months in northwest Oregon. Among them were roundtables in each of the five counties in the 1st District — including Jan. 25 in Beaverton — a meeting Feb. 20 with educators in Beaverton, and visits to Tualatin Together, Lifeworks Northwest in Beaverton, and the pharmacy at Providence St. Vincent Medical Center. Though she has signed on as a cosponsor of several other bills, Bonamici found none of them dealt specifically with the disposal of unused opioid medications that often end up in the hands of children, family members or friends. "Unfortunately, it can be easier to get an opioid prescription than to safely dispose of unused pills. We need to do better," she said. "We must make it easy to safely dispose of unused medications." Her proposal (HR 5557) would create a self-funding grant program, paid for by a fee on manufacturers for the opioids they sell, to help pharmacies and others set up 10,000 disposal bins. Current disposal alternatives include police stations, which some people are wary of, or drains and toilets that end up persisting in the environment even after wastewater is treated. According to a 2017 Government Accountability Office report, less than 5 percent of Oregon pharmacies, hospitals and other eligible agencies participate in disposal programs — although that mark exceeds the 2.5 percent national average. Dr. Sharon Meieran, a physician and Multnomah County commissioner, joined Bonamici at the release of her opioid plan Monday, April 23, at The Round in Beaverton. "Congresswoman Bonamici's legislation speaks to the need for straightforward, common-sense solutions," Meieran said. "It has to be at least as easy to get rid of opioids as it is to get them in the first place." Other parts of Bonamici's plan endorse prevention of addiction, treatment and recovery for people who have abused opioids, and alternatives to opioids for pain management. Medicaid, the joint federal-state program of health insurance for low-income people, pays for many treatment and recovery programs. An estimated 14 million people obtain opioid medications through Medicare, the federal program of health insurance for people 65 and older, and for some people with disabilities. She met people in recovery and parents of children who died from opioid abuse. "As a mom and as a policy maker, I found the stories from people in recovery and about the lives lost to opioid abuse to be heartbreaking," she said. One of them was Jessica Cardinal of McMinnville, who joined Bonamici. "I was young and trying to fit in a new town when I started using pills," Cardinal said. "Over time I switched to heroin. Now I've been sober for three and a half years, but I've gone to more than 10 funerals of people who died from addiction in that time. "As a recovery mentor helping other people overcome addiction, I know firsthand that we have to increase access to treatment, or people will keep dying from this disease." Link to the full report by U.S. Rep. Suzanne Bonamici, "Fighting for Our Communities: Overcoming the Opioid Crisis."